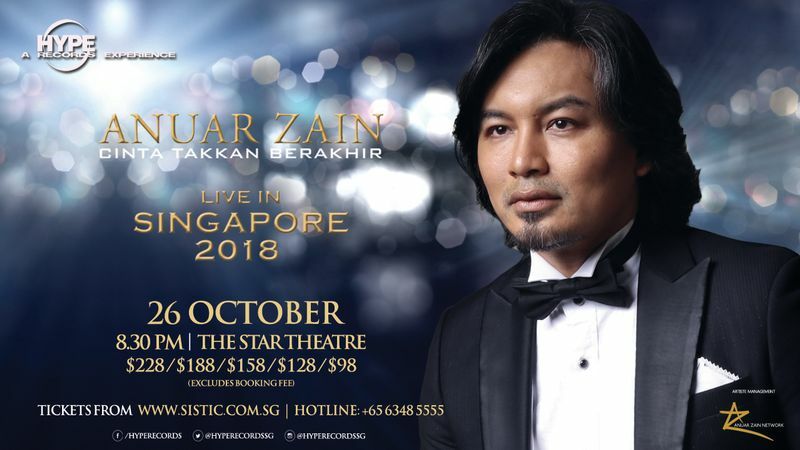 Malaysia’s singing sensation Anuar Zain finally returns with a brand new concert this October, especially for Singapore fans! Most recently awarded Best Male Artiste at the regional Anugerah Planet Muzik Awards 2017, Anuar Zain is best known for his charismatic performances and soulful renditions of emotional ballads. An extraordinary performer in the region, his popularity and creative standing in the music scene remain undisputed since breaking out in the music scene at the tender age of 13 years old. Conferred with countless music accolades at the Anugerah Industri Muzik, Anugerah Juara Lagu and Anugerah Planet Muzik award ceremonies, Anuar Zain’s remarkable vocals and music talents have placed him in a league above the rest and cemented his status as one of the region’s most sought-after artistes. The royalty of the Malay music scene, whose illustrious music career spans over more than three decades, has also long established a strong and loyal fan base from all over the region. Following the overwhelming response to his critically acclaimed concert in 2015, the multi-award winning crooner is back to impress Singapore fans with new music materials. Be enchanted as he presents a memorable night of astounding showmanship, new songs from his latest album, as well as popular mega hits such as “Lelaki Ini”, “Sedetik Lebih”, “Sempurnakan Aku”, “Bila Resah”, “Andainya Takdir” and more in this highly anticipated concert!